Montecito Line stylish and solid counter-top calculator with digital calendar and pen combination. It comes in choice of three finish colors: black, silver or gold, and also in choice of square or round corners (pictured here with round corners). Size: 5-1/4" x 10". Also has a double-coated adhesive base. 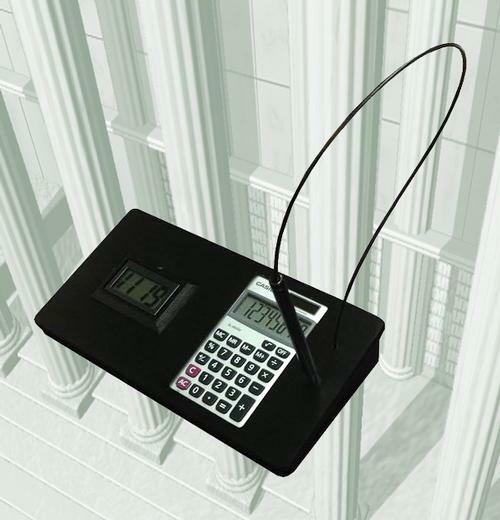 Montecito Line stylish and solid counter-top calculator with digital calendar and pen combination. It comes in choice of three finish colors: black, silver or gold, and also in choice of square or round corners (pictured here with round corners).